Skyline’s wrestling teams for the 2018-19 season have been wildly successful in the tournaments and meets that they have competed in. 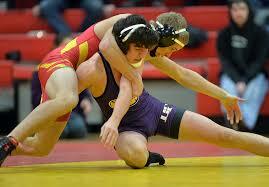 At their previous tournaments, they have placed well overall, and have had many individuals place high up. Coach Andersen says one thing that makes the team so successful is the fact that they’re all close. “They’re all friends, which is good. I think going into next year, it’ll be nice, because we have a lot of young guys,” Andersen said. “Keeping them as a group and getting them together in the off-season will help us be stronger in the future, as well.” Even as the older wrestlers graduate, Coach Andersen hopes that the future teams will be able to bond as well as this team has. James Monson also competes personally, often placing well. He regards his biggest accomplishment as placing fourth in the state wrestling tournament. James has also placed high and done very well in many other tournaments the team has attended. When the coach isn’t around, James also helps the team run scrimmages and practices. At the Granite District Tournament, the team placed third overall and in their weight classes, Aiden Rod, James Monson, and Jacob Walker all placed first. Many of the other team members placed as well. At Kearns, the team competed in the Kawa Clash. They placed well in that competition, too. James Monson took third place and Jacob Walker both placed second for their weight classes. They most recently competed in the Christmas Clash, where James Monson and Jacob Walker both placed second. Coach Andersen looks forward to the next years. He says that although they have a lot of good, older wrestlers, there are a lot of young members on the team he looks forward to seeing progress and becoming very skilled wrestlers. One of his favorite parts of coaching, he says, is seeing them advance. He also says that one of the most important things to making the team successful is keeping them healthy. Skyline’s wrestlers and the coach all look forward to finishing off the season in February on a high note, and placing as a team and as individuals in the competitions.